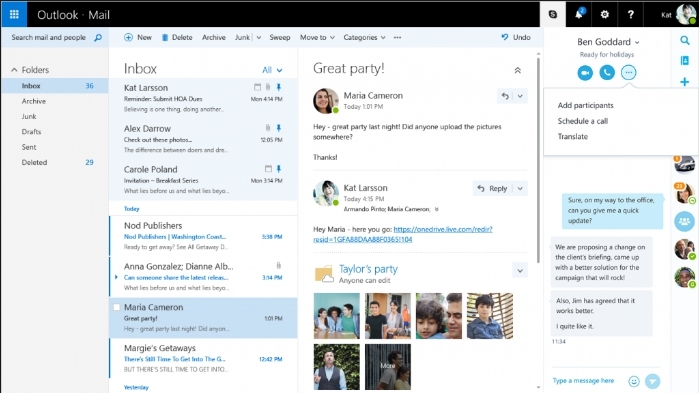 Microsoft is working on a brand new design for the web variant of its popular Outlook email service. It will support all devices running Windows 10. Here is how to get new Outlook design for Windows 10. This new Outlook.com design is still in beta testing phase but there is a way to get early access to the new beta design on the web, keep on reading to learn how to use new Outlook design on Windows 10. New Outlook design is currently in beta and is being rolled out in phases to test and get feedback from customers to spot any issues with its performance and fix it before final release of full version to the public. For now, anyone you wishes to use this new Outlook design can get it using the ‘Try the beta’ toggle on the web. However, it’s being reported that the option to activate the new interface design is not showing to everyone, but there is a trick you can use to get that option back and start using new Outlook design right away. In this tutorial, you are going to learn how to get early access and use the new Outlook design on the web. 1 – Open Microsoft Edge browser. 2 – Sign-in to your Outlook.com account. 3 – In the address bar of the web browser, replace the /owa/ from the URL with /mail/ and hit enter. As soon as you hit enter, it will take you to the new Outlook.com design, where you will be able to see the new ‘Try the beta toggle’. But, don’t click on it unless you want to go back to the old design. New version of the Outlook is being rolled out in stages that brings new design tweaks and changes to the interface to make it look more like the Main app on Windows 10. In the new version, new design also brings better navigation options, support for emoji and GIFs, and the quick attachment and reading features. There is also a new option that allows you to preview files and images in the conversation list. Search bar has been moved to the top-left corner of the interface and can be used to find specific emails, contacts, groups, and lots more. Do give this new interface design a try, you will surely like the new look and feel of the Outlook.com on Windows 10.